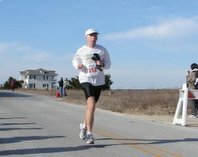 The last in the 2007 NCRC/Omega Sports March Trail Series was run this past Sunday at 2PM. We had another gorgeous day and a good turnout for a nice run on the Loblolly Trail at Umstead State Park. We had amazing weather for all four of our runs this year and everyone in attendance had a good time. Bobby Baxter, Karla Werner and myself were the only ones to make it to all four weeks but several made it to at least 3 including Melinda Larr, Mike Walsh and Paul Fisher. Week one was held on the American Tobacco Trail in Durham. Week two we moved to Blue Jay County Park and the Falls Lake Trail. Week three was Umstead North and the Sal's and Pott's Branch Trails. I have some photos here. I just got a group photo the first two weeks but I did get some along the trail the past two weeks. My wife (Melinda) and I have ran with Joey on a couple of occasions with the NCRC trail series: Blue Jay park and Umstead where we ran the Loblolly Trail.